Julian TileOnix Mosaics from Spain. 98% Recycled Content. Julian Tile is an importer/wholesaler of Floor and Wall Tile and Stone. Julian Tile distributes tile & stone as well as setting materials and tools to major tile stores in Western Canada and Washington State. Onix Mosaics from Spain. 98% Recycled Content. 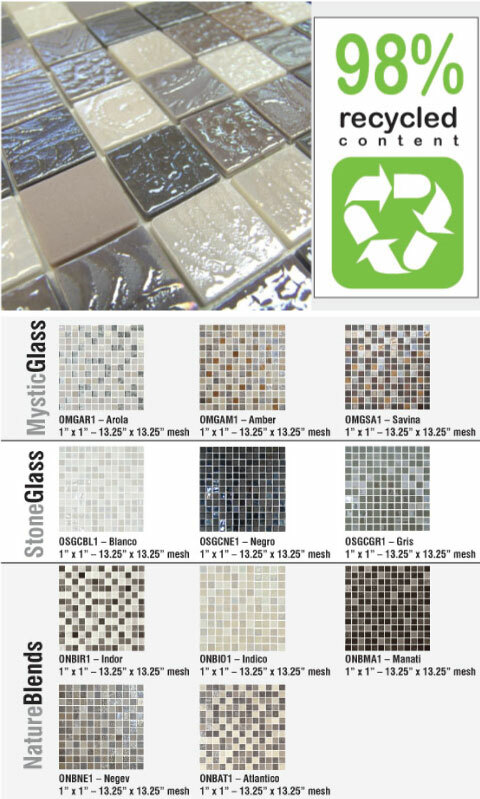 The Mosaics by Onix are a symbol of distinction, a break from the norm and an expression of personal style with which interior design redraws its boundaries and rethinks preconceived ideas to become a decorative element of considerable added value. As the light strikes our high-quality textures, it creates a combination of effects that generate the most spectacular atmospheres. Their incredible versatility liberates the innovative and avantgarde spirit of whoever chooses them without placing restraints on creativity because these mosaic tiles are capable of harmoniously blending in with any other component chosen for interior design projects. An entire decade of dedication to modern design and innovation has provided ONIX with a unique identity, making it stand out from among the leading companies in the sector. Homes, public spaces and shopping centres around the world have all been designed according to the ONIX spirit; a spirit that entices you to live the future in the present through the selection of any one of the numerous and versatile collections we have to offer.